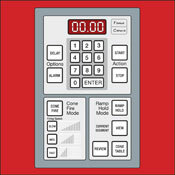 The sealed touch pad, shown above, is designed with single-function control buttons that are grouped to make programming a snap. There are no special codes to memorize—just follow the prompts. Because the KilnMaster allows you to store programs, it is simple to recall your stored program and begin the firing. A real timesaver. Nearly all Skutt kilns have Computer Balanced Elements. 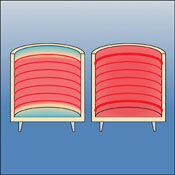 This means we design the elements so that more heat is put in areas of the kiln that naturally fire cooler. 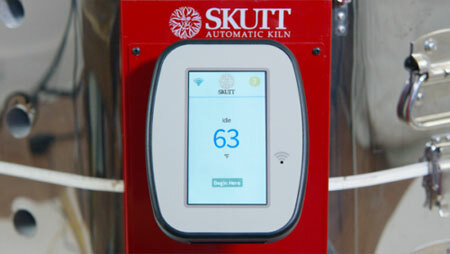 The top and bottom of the kiln lose heat faster than the center so Skutt puts hotter elements (more power) in those areas. The figures above indicate how a kiln with Balanced Elements will take a naturally unbalanced chamber and adjust it to be balanced. Like Your Smartphone the new KMT controller navigates with just a touch of a finger and allows us to guide you through programming with full sentences, helpful icons, and dynamic navigation. Built-in WiFi makes it possible to download any software feature upgrades for free so it is like having a new Kiln Controller for the life of the kiln. Skutt's rolling stands are constructed out of heavy duty, welded square tubing and fitted with high quality, locking polypropylene castors. Polypropylene wheels roll smoothly across the floor. They provide the recommended clearances from the kiln to the floor and many are adjustable in order to raise the loading level to a height that is comfortable for you..
Skutt’s 2 year warranty is straight forward. If you have a failed component on your kiln within 2 years of purchasing it, we will fix it. We will pay parts AND labor. 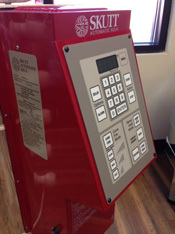 Many of our full service distributors will even repair the kiln on site. Due to the fact that it is possible to exceed the estimated life of a thermocouple before the end of the warranty period, thermocouples are the only items we do not cover under our warranty. 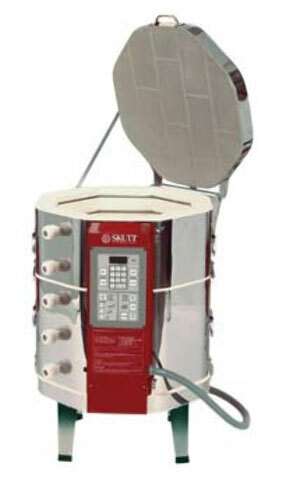 Example of kiln furniture kit. Please Review the Delivery Checklist Before You Order!